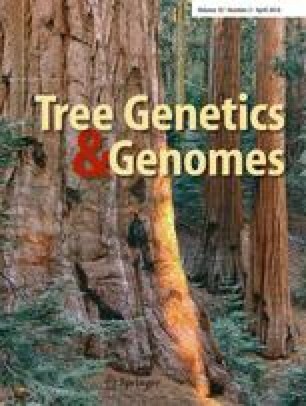 Forest harvesting and renewal practices using clearcut harvesting followed by artificial and natural regeneration (NR) may impact genetic diversity in subsequent forest tree populations. Plantations (PL) and phenotypic selections may exhibit lower genetic diversity than natural old growth (OG) and naturally-regenerated young populations because they may have a narrow genetic base. We used ten (six EST and four genomic) microsatellite loci, to reassess genetic impacts of silvicultural practices in white spruce (Picea glauca), previously assessed by using 51 RAPD markers by Rajora (1999). Allelic diversity at the genomic microsatellite loci was about three times higher than at the EST-derived microsatellite loci. Although the trends for microsatellite genetic diversity among different stands types were similar to that observed for RAPD markers, with natural OG stands showing the highest and tree improvement selections the lowest allelic and genotypic genetic diversity, no significant differences were observed for microsatellite genetic diversity among OG, young NR, PL and open-pollinated progeny of first-generation phenotypic selections (SEL). The inbreeding levels and genetic differentiation among populations within OG, NR and PL were also similar. However, phenotypic selections had somewhat different genetic constitution as they showed the highest genetic distances with OG, NR and SEL. On the other hand, the lowest genetic distances were observed between the OG and NR stands, which also had similar levels of genetic diversity. Our study suggests no significant negative impacts of harvesting and alternative reforestation practices on microsatellite genetic diversity in white spruce and calls for using more than one marker type in assessing the genetic impacts of silvicultural practices in forest trees. The research was funded by the Canada Research Chair Program (CRC950- 201869) funds, Natural Sciences and Engineering Research Council of Canada (NSERC) Discovery Grant RGPIN 170651 and New Brunswick Innovation Foundation (NBIF) Research Assistant Initiative (RAI) grants to O.P. Rajora. Manphool Fageria was financially supported by the NSERC Discovery and NBIF RAI grants to O.P. Rajora, School of Graduate Studies, University of New Brunswick and a Canadian Forest Service graduate student's supplemental stipend. We thank Andrew Baird, Daniel Frank and Nancy Kang for assistance with microsatellite genotyping and data scoring, and Jean Beaulieu, Zeki Kaya and two anonymous reviewers for their useful comments on the previous version of this manuscript. The research results reported here are a part of the PhD thesis work conducted by M.S. Fageria under the supervision of the project principal investigator O.P. Rajora. MSF: partial microsatellite genotyping, data analysis under the directions of OPR, initial manuscript draft preparation and revision. OPR: study conception, experimental design, field sampling, DNA preparation, overall study direction and supervision, data interpretation, manuscript writing and revision. The microsatellite genotype data will be deposited to Dryad data repository.